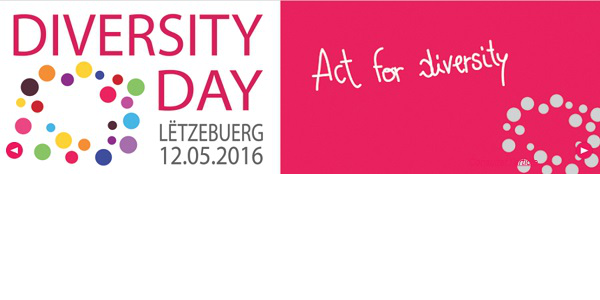 On 12th May 2016, Luxembourg celebrates its second national diversity day. Participate by organizing actions for your employees, providers, partners and/or a wider audience! Any kind of organisation based in Luxembourg is encouraged to "Act for diversity" on this specific day, whether it is a business or a public organisation, small or large, whether or not signatory of the Diversity Charter Lëtzebuerg. The 12th of May is a unique opportunity to show commitment to diversity through concrete actions. Corinne Cahen, Minister for Family and Integration as well as patron of the Charter, will pay an official visit to some of the participant organisations during the 12th May.